Welcome to the March Nano Bite, the monthly e-newsletter for the Nanoscale Informal Science Education Network (NISE Net). Featured on the Website: Water - What's nano about water? A lot of training and planning goes into NanoDays events, and we want to say thank you to all of our partners who are planning events this year, who have hosted events previously, and who will continue to carry on NanoDays into the future! NanoDays Training Videos - Over 40 videos available online! Complete list here. We would also like to recognize all the NISE Network partners who have been involved in making NanoDays so successful by providing ideas for activities and materials, helping to develop hands-on activities, materials and resources, hosting events, recruiting and training volunteers, providing feedback, and so much more. Thank you! Hear from partners who have used team-based inquiry (TBI) to improve their own staff and volunteer trainings around nano. Find out what they've learned, their experiences, and how their knowledge might help you plan your own trainings and/or evaluation. New science, like nano, can be misused, misconstrued, or co-opted by greed. This conversation will explore how to identify poor science and will examine how the word "nanotechnology" has been used to sell a variety of products. We'll finish with a fun "real-science vs. pseudoscience" game show! 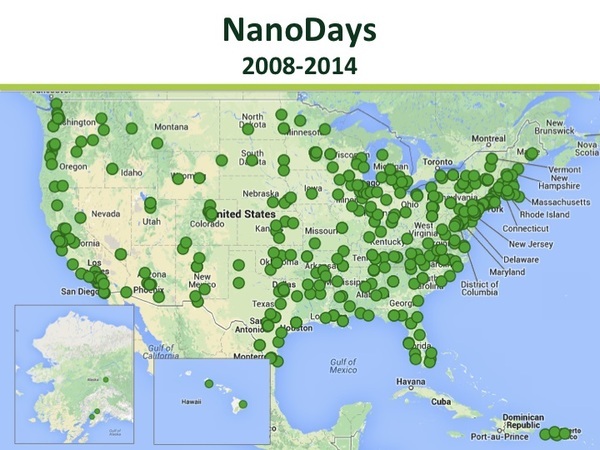 In this second in the Science Behind NanoDays 2015 series, Lizzie will discuss the scientific background of two more NanoDays activities and their connection to cutting-edge research: Exploring Products - Nano Food and Exploring Tools - Transmission Electron Microscopes (TEMs). Did you miss the first Science Behind NanoDays 2015 - Part 1 on graphene and nanocoatings? Watch a recording of this brown-bag and click here for even more resources from the conversation. → What's nano about water? Scientists and engineers are developing filters from nano-sized materials to clean water, helping to reduce most disease-causing organisms, providing drinkable water. With Groundwater Awareness Week (March 8-14) and World Water Day (March 22) taking place this month, we thought we'd share NISE Net water-themed activities and resources with you! Cleaning Our Water with Nanotechnology - program that discusses how using nanotechnology can help make contaminated water safe to drink. The Water Race: Hydrophobic and Hydrophillic Surfaces - activity that discusses how nanotechnology can be used to change material properties to either attract or repel water. What's Nano About Water? - NISE Net short video discusses how filters using nano-sized materials can help reduce disease-causing organisms and create safe drinking water. Dragonfly TV - Water Clean Up video showcases kids conducting inquiry-based investigations, aided by science museums and university research labs. Lotus Leaf Effect - a hands-on demo that demonstrates how nature inspires nanotechnology by sharing how nanoscale features can influence how material behaves at the macroscale. 2015 has been a winter to remember for much of the United States. Unpleasant weather has kept many people confined to the indoors for much too long, reducing the amount of time spent outside in the natural sunlight. But imagine if you could feel the effects of the sunshine inside your home or office. Engineers have tried to replicate the sun's spectrum in light bulbs previously but have missed the mark. However, the developers at CoeLux believe they're spot on. This fixture uses traditional LEDs calibrated to the same wavelengths as the sun but also includes the missing link: materials that mimic subtle atmospheric variations. To accomplish this, CoeLux's inventor, Professor Paolo Di Trapani, uses millimeters-thick plastic peppered with nanoparticles to replicate atmospheric particles and thus casting more realistic artificial sunlight and shadows. As Paolo Di Trapani states, "imagine the new kinds of buildings enabled by this technology...'groundscrapers,' or buildings that stretch hundreds of feet into the ground might exist, yet don't make you feel like you've descended into a deep, dark cave." Read the full article on this newest invention and to watch a short video on the technology. How do you get a science center, technology museum, a national science network, a public library system, a 3D printing service and marketplace, a camera company, and a university research center to work together—you just have to pick up the phone and talk about nanotechnology. In the spring of 2014, I received a call from a colleague from the Sony Wonder Technology Lab with an inquiry about co-hosting the Nano Mini-Exhibition in New York City. The exhibition was scheduled to land in Manhattan for a year, but due to shifting exhibition schedules, they needed to find a new home for the exhibit—and why not in Brooklyn? I jumped at the chance to host the exhibit and to fill a gap in the exhibition schedule at Brooklyn Children’s Museum. We had been working with NISE Network for the past year by hosting our first NanoDays and utilizing the Nano kits in afterschool and public programming. It seemed like a natural fit to try and host the mini-exhibition, so with the concept of nano in mind, I started to look for appropriate exhibit pairings to create a larger 1500 square foot exhibition. My goals were to introduce children to the science of understanding the micro-world, and then see how discoveries in these fields lead to technological innovations. What came together became known as an exhibition called More Than Meets the "I": Exploring the new frontiers of biology, health, robotics, and technology...Utilizing the Nano Mini-Exhibition as a catalyst for a larger story about emerging technologies broadened our conversation about what role nanotechnology has at a children’s museum. Continue reading the full Partner Highlight to learn about the many collaborations that brought the Nano mini-exhibition to life at Brooklyn Children's Museum! → March is the month we all love because after months of dreary winter weather we (most of us) finally get an extra hour of evening daylight back and what better way to spend that extra light then by doing and learning science ! Read the Nano Bite e-newsletter online at /newsletter/nano-bite-march-2015.